From the 31th of july to the 6th of August the War-Starts-Here camp will set up in Potzehne (close to Magdeburg, Saxony-Anhalt,Germany). For several years now the War-Starts-Here camp has brought together lots of different people close to the modern and important military training site in Germany, the “Gefechtsübungszentrum Heer”, abbreviated as GÜZ. Antimilitarist discussions as well as practical resistance left a persistent mark on both the participants of the camp and the surrounding region. The images of refugees vanished from public perception. Though they are still existing: countless people have to leave their homes day by day, facing inhumane and life-endangering hurdles on their search for nothing more than a secure place to live. Still, hundreds of people drown in the Mediterranean. Hundred-thousands persevere under precarious conditions in camps beyond the borderline of Fortress Europe, almost without any prospect for change. They seem far away, too far for many to see their persisting distress and the inhumanity they face. Many people became involved in welcoming arriving refugees and are still staying with it. The – especially in Germany – publicly invoked “Welcoming Culture” was politically thwarted in almost no time by further eroding the right of asylum to its de facto annulation. Instead, militarisation of Fortress Europe and agreements with dubious regimes on camps trapping refugees within the countries they are fleeing from are being put in place to prevent people seeking shelter here. More and more states are being declared as “safe” countries of origin, into which refugees can be deported easily, which is done on a daily basis. Refugees are enduringly trapped in a demoralising loop, persistently facing uncertainty and fear, while desperation and powerlessness reinforce their traumatising experiences of war, terror and flight. Those who try to oppose, struggling for a human treatment of refugees and borderless solidarity, are confronted with harsh restrictions and repression by the state. And instead of abolishing causes of flight, governmental action in terms of defence exports, further armament and war deployments creates even more of them. By this, feelings of powerlessness and hopelessness may be intensified, but for us they also support our will to take action against this misanthropic policy. It’s time to gather in order to develop new strategies of hands-on resistance, of how we can overpower together the paralysing powerlessness and of how to unite in solidarity – small steps of transformation, that reflect glimpses of another possible world. With the War-Starts-Here Camp we’ll take a strong stand against the belligerent situation underlying war, terror, flight and migration. We’re struggling for a world in which no one is forced to leave one’s home due to war or wo*man-made devastation of one’s basis of life. For a world without borders, that’s worthy to live for everyone! For this year’s camp we build on last year’s main issues. 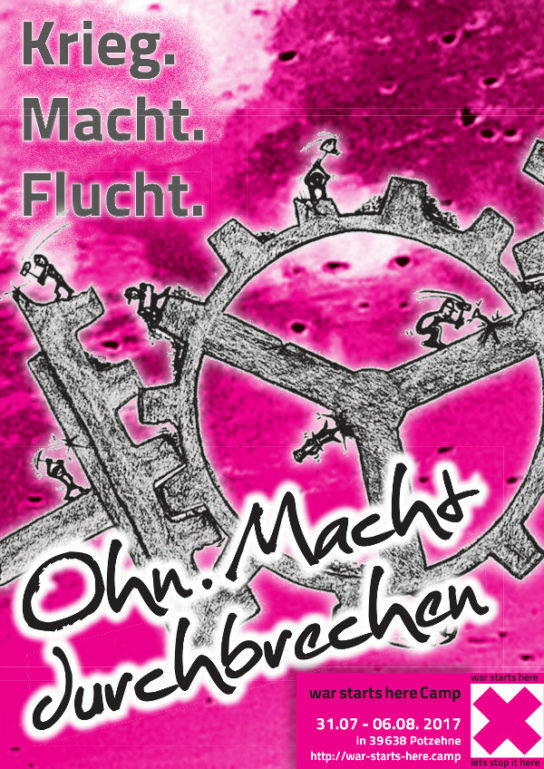 The motto “Krieg.Macht.Flucht.” is still up-to-date, saying “war causes flight” while making use of the ambiguous German word “Macht” (translating both as “makes”/”causes” and “power”). This time our focus will be the development of common anti-militarist and anti-racist perspectives of resistance. Let’s overpower our powerlessness – the camp in Potzehne wants to provide a space for that. We want to have discussions at a horizontal level with everyone sharing our radical refusal of the global destructive circumstances. Training, exercise, preparation and export – war starts here! We want to make this deadly site publicly visible, since it is of crucial importance to war preparation. Through various antimilitarist actions we want to disturb the “normal” operation on the GÜZ, let’s mark, block, and sabotage this full-speed-running machinery of war! The camp is self-organized and thus, in its existence, shape and impact depending on active participation. Do not miss anything you haven’t helped to organize! Together we create a social counter project: From a society deeply infiltrated by authoritarian structures, let’s set sails towards Utopia. Our acceptance has limits: nationalist, antisemite, islamophobic, racist and sexist attacks happen much too often. Exclusions based on characteristics as clothing, age or use of language happen much too often. We are trying to be aware of, question and change our own socialized way of thinking and our behavior and we expect everybody to do the same.